Understandably behaviour is one of teachers’ greatest concerns. It has a massive impact on: the quality of a teacher’s professional life, how well s/he can do their job and a teacher’s personal well-being. Behaviour is likely to be easier to manage when there is a whole school consistent approach. I’m currently working on a resource around the Quality of Teaching. 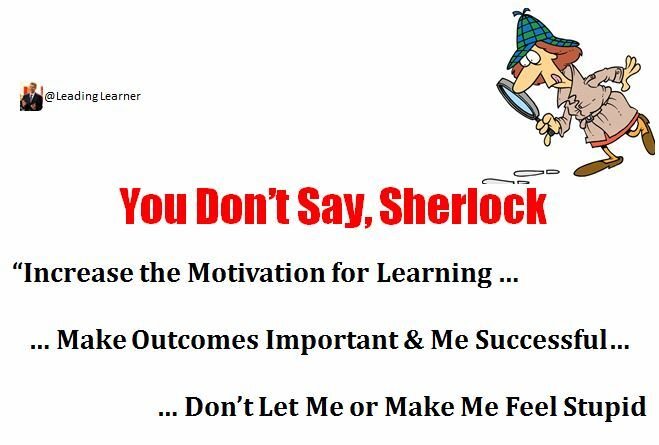 Whilst the main focus will be on planning the expected learning gains and delivering them it would be impossible to write anything worthwhile without acknowledging the impact of behaviour. The above table is an outline of some key stages or signposts towards improving the Quality of Teaching. 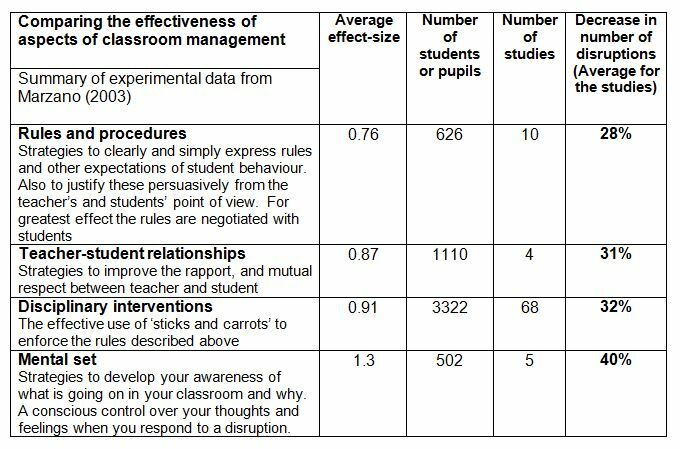 Taking the “Student Behaviour” strand, it seems a statement of the obvious, where there is significant student disruption in lessons, low or high level, then learning will not occur. Sadly, too many teachers spend time in class surviving. Both they and their students deserve better. As students become increasingly compliant with the standards of behaviour expected of them the Quality of Teaching can start to improve. Teaching needs the right conditions to flourish. Engagement is not simply creative tasks and activities or having fun though these have a part to play. It is also about challenging and interesting work for students to develop those moments of flow. Interdependence potentially moves the learning to a whole new level but needs to be seen within the context of the whole. It is not something you simply do in this or that lesson. It is a level of maturity in the learning process where the learner positively acknowledges and uses resources including the teacher, other students and people across and beyond the school to benefit her/his learning. In turn the student is a resource to others. Their learning behaviours are self-motivated. This needs to be explicitly planned for and built over time. 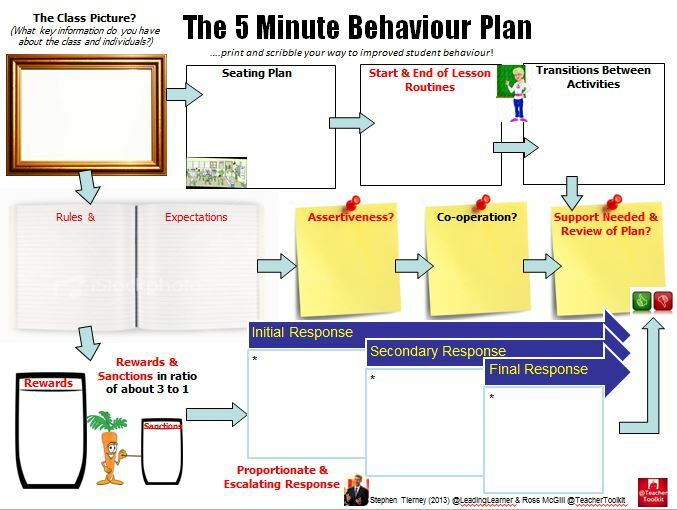 The following three posts give a background and some useful practical strategies to help you get that behaviour right. Before releasing the #5MinBehaviourPlan Ross and I looked at a structure for the plan. We built the plan’s structure around the work of Robert Marzano et al (2003) “Classroom Management that Works” as quoted in Evidence Based Teaching (Petty, 2009). The four elements: Rules & Procedures; Teacher-Student Relationships; Disciplinary Interventions and Right Mental Set are explained in the post alongside some reflections from the class room. This plan is great for new teachers or more experienced ones who just want to make sure they are bringing a systematic approach to the management of behaviour. There are a set of boxes to prompt thinking about key elements of behaviour management. Behaviour is likely to be easier to manage when there is a whole school consistent approach, however, each teacher has a professional responsibility to get it right in his/her classroom . I used the plan to illustrate the new Behaviour Policy we have put in place at St. Mary’s Catholic College. It isn’t rocket science but it does require people to be consistent. Over the past few years consistency has improved as staff and students have become more familiar with the various elements. There is always more that can be done but staff, students and parents have all recognised the even better behaviour through our various annual evaluations. In great schools behaviour is more than compliance and engagement. These schools have built an aspirational culture in which students’ motivation becomes intrinsic compared to the more extrinsically motivated behaviour systems put in place by the school. This culture is more easily built where the values of the parent body are aligned. However, in areas of high deprivation or low aspiration it becomes even more important.